There are several ways to influence national mean IQ levels. One is to improve nutrition and education, but vitally important though they are, they suffer from diminishing returns as populations bump up against their genetic ceilings. Another is to promote eugenic policies, or at least policies to mitigate the dysgenic trends that are typical of modern developed societies, but they tend to be ethically questionable and politically unfeasible. The third major lever is the immigration system, but how can we assess whether it’s doing its job of only letting in the people who would be a net benefit to the host country? 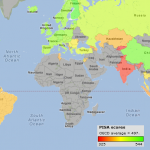 In my wanderings through the interwebs, I found that the NCES has an excellent “International Data Explorer” with all kinds of socio-economic data on the tested students of each country that participated in the PISA standardized tests (which correlate closely with IQ). Of particular interest was data on scores broken down by immigration status (native, 1st generation, 2nd generation), which was frankly stunning in the degree to which it confirms various stereotypes and explains why migrants succeed in some countries and live in lawless ghettos in others. See the graph below (click to enlarge). One thing that immediately leaps out from above is that just as US scores leap upwards (from 496 to about 525, in line with Australia and Canada) once only whites are considered, so do scores in many European states when only natives are considered (e.g. Germany from 510 to 533; Switzerland from 517 to 542; the Netherlands from 519 to 533). In fact, the countries mentioned above and a few others equalize with Japan’s 529, Taiwan’s 534, and South Korea’s 541 (the natives of these developed East Asian societies also score a lot higher than their immigrants, but the overall effect on the national average is modest because migrant children are such a small percentage of their school-age populations). In other words, in the worst affected European countries, immigrants are lowering the mean national IQ (converted from PISA scores) by as much as 3 points. This might not seem like much, but it is highly significant when bearing in mind the extremely close correlation between national IQ and prosperity. Furthermore, since immigrant populations tend to be highly variant – for instance, Britain has a lot of Poles, who are essentially equal to the natives in cognitive capacity (maybe even superior, once you adjust for the fact that it is better-educated Poles who tend to emigrate), and a lot of Pakistanis, who are far below them. This is a good explanation for the general sense of dereliction one sees (and the crime one is likely to experience) when entering Pakistani ghettos in the UK. Also note from the graph that there is typically a very high degree of overlap between 1st and 2nd generation immigrant children. The 2nd generation children DO typically perform better, presumably because 1st generation immigrants may frequently have language difficulties and problems with adjusting to a new culture. But the degree of convergence of 2nd generation children to the native mean is modest, despite their transferal to typically far more advanced educational environments. Convergence is almost inconsequential in most European countries like Germany, France, Benelux, Norway, and actually negative in the US (i.e. American 2nd generation immigrant children do worse than the 1st generation). 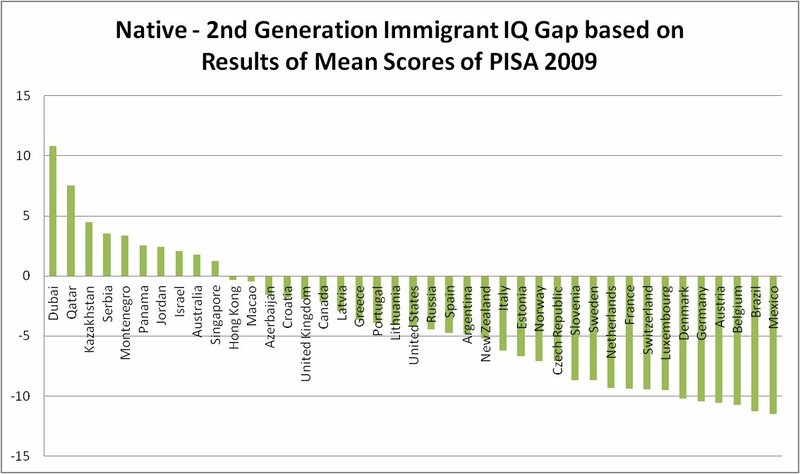 This second chart shows the IQ gap – derived from the differences in PISA scores – between native children, and children who are 2nd generation immigrants (i.e., born within the country in question). I think that it is more useful to compare the 2nd generation with natives than the 1st generation because their educational environments will have been similar; the language issue will have vastly declined in importance; immigrant population will have taken their first step in “reversion to the mean” in terms of their ethnic group IQ; 2nd generation progeny are far less likely to emigrate back to their countries of origin; etc. So what do we see here? (1) Australia (2nd generation migrants have +2 IQ points relative to natives) and Singapore (+1), two countries with immigration policies that are cognitively elitist in practice, enjoy immigrants that are superior to the native population and will clearly benefit them a lot. (3) I’d have expected the UK’s (-2) immigrants to perform about as badly as in the rest of Europe, but on inspection, it’s in the same boat as Canada. Yes, there are many Pakistani and Black immigrants, but Britain also attracts many well-qualified East-Central Europeans and Asians. (4) The US (-4) has an idiotic immigration system that penalizes highly-qualified workers while being relatively lax at controlling (inevitably unqualified, lower-IQ) illegals from Central America. But nonetheless, it’s an economic and technological dynamo, and despite policy failures there are still plenty of high-IQ immigrants. (5) Spain (-5), Italy (-6), Norway (-7), Sweden (-9), the Netherlands (-9), France (-9), Germany (-10) and Belgium (-11) have progressively worse quality immigrants relative to the natives in their countries. (The reason for why the Med countries do “better” than the Teutonic ones isn’t because they have better immigrants, but because their native IQ’s are lower). Unlike the US, they tend to have few highly-qualified immigrants, as English speaking (and typically lower tax) nations like Australia, the US, etc. are more attractive to high-IQ cosmopolitans. What’s more, a big proportion of the immigrants to Europe are Muslims, whose faith and habits conflict with local mores to a far greater extent than Catholic Hispanics clash with the indigenous American culture. 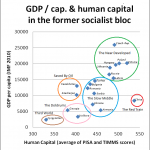 (6) In countries like Dubai, Qatar, Kazakhstan, and Israel, the higher quality of immigrants is presumably due to the fairly low human capital of the host nations themselves. (7) It is interesting to know that the country with the biggest gap between natives and 2nd generation immigrants for which statistics exist is Mexico (-12), which is known for contributing many low-quality immigrants itself. So the immigrants who come to Mexico are truly bottom of the barrel types, which presumably explains why Mexican border defenses to the south are militarized to an extent that would drive liberals apoplectic if implemented in the US. This, and the lure of El Dorado to the north, probably explains why Mexico itself doesn’t have an immigration problem: Although it might have the worst immigrants relative to its indigenous population, Mexico’s native (421) and national (420) average PISA scores are virtually identical, implying that its immigrants are numerically insignificant. Immigrants are a matter of both quantity and quality. If immigrants are overwhelmingly low-IQ relative to the host population, but very low in numbers, as in Japan or Mexico, then this isn’t a major concern. If they are are high in numbers, but comparable to the host population, as in Australia, then this isn’t a huge concern either. If they are high-IQ relative to the natives, then it’s typically a boon for the host nation, as with Israel (presumably thanks to Ashkenazi Jews from the former USSR), or the Arab oil states; though a longer-term concern might be the emergence of “market dominant minorities”, such as the Jews in old Europe, or the Chinese diaspora in South East Asia. However, clearly the worst scenario is when immigrants are both many and far inferior in IQ to the aborigine population, to the extent that the mean national IQ appreciably plummets due to their influence. The final graph is perhaps the most important. 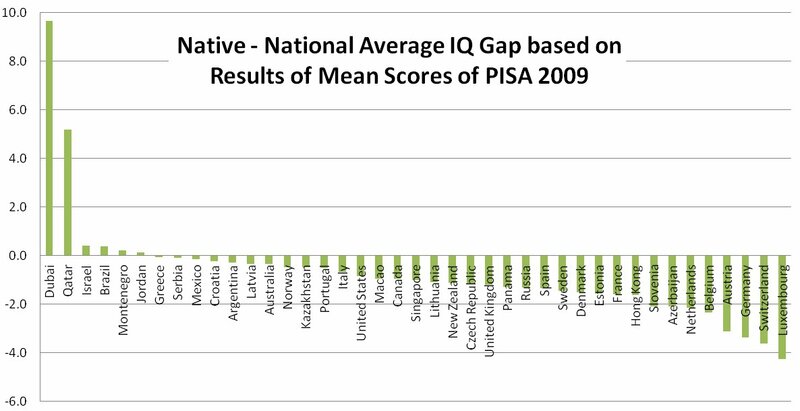 It shows the difference between national average IQ’s, and average IQ’s for natives, as derived from the PISA scores. Countries experiencing a net fall in the average IQ relative to the native IQ of more than 2 points include Benelux and the Germanic lands. More modest falls in average IQ are experienced in France, the UK, Russia, and Canada. The gap in the US is only 0.9 – presumably, because unskilled Hispanic immigrants aren’t the worst types can get, and are further counterbalanced by many skilled, high-IQ immigrants from Asia; and also because the native US population already includes Blacks, whereas European countries don’t tend to have sizable low-IQ indigenous minorities. In Norway, where Breivik comes from, the effect is only 0.5 points, and in Greece, where the Golden Dawn party recently put up a good showing, it’s a truly insignificant 0.1 points. I wonder why the strongest anti-immigrant reactions are in countries where the issue isn’t all that significant? It is not controversial to argue that immigration policies should ideally benefit the host country. Liberal economists in particular argue that for loose immigration policies, especially in the case of countries with rapidly aging populations, so as to arrest the decline of the workforce and pressures on pensions. They tend to view the incomers as a source of labor, rarely accounting for its quality in any detail, let alone considering the long-term social and economic consequences of the mass influx of lower mean IQ populations. In reality, IQ is closely correlated with any number of highly important things like productivity, criminality, civic-mindedness, welfare dependency, etc. and research is converging on the view that IQ is highly heritable and that different ethnic groups have different genetic IQ ceilings. This is all reflected in the far lower average cognitive capacities of the immigrant populations of Europe, and to a lesser extent, the US and Canada, relative to that of natives. For a long time this view necessarily had to be based on stereotypes, anecdotes, or at best limited regional studies, with the consequence that someone raising these issues ran the risk of being called insensitive to “institutional racism” and various other, largely irrelevant liberal/PC hogwash. The detailed PISA results demonstrate that schoolchild immigrant IQ’s may rise somewhat when they are born in developed nations – the average for all countries on which data is available is a rise of 1.6 IQ points from the 1st to 2nd generation – as they get access to better nutrition and education (i.e. experiencing an accelerated Flynn Effect), and resolve any lingering language issues; but for all that, they remain far closer to the stock from which they came, while convergence to native IQ levels typically remains modest or non-existent. Just giving it more time, Newspeak, and diversity officers won’t resolve these issues. As it stands, to varying extents, the developed world has decided to just that – stick its head in the sand and pour calumnies – not to mention the occasional prosecution for “hate speech” – on dissenters such as Thilo Sarrazin. The PISA 2009 data in full.